Enjoy a quick brew day and make Gose, Smoked Ale, Pennsylvania Swankey, Strawberry-Peppercorn Short Mead, Tart Blackberry Cider, Boozy Kombucha, Kefir Beer, Absinthola, Mauby, Tepache, and more! Homebrew tastes great, it's inexpensive to make, and it's equally fun to brew old favorites and new recipes. There's only one thing stopping you from brewing your 1st or 101st batch: time. Whether it's your kids, your job, or a million other things, it can be hard to find a free brew day. Then there's the agonizing wait to crack that first cap. But what if you could brew a session IPA in just a few hours? Or if you could brew a sour beer that's ready to drink in weeks instead of months? 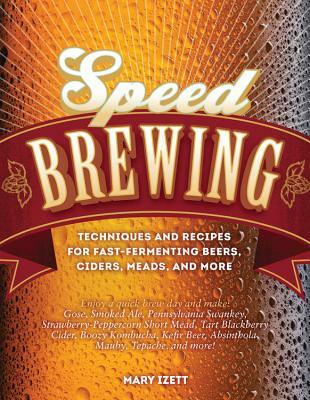 In Speed Brewing, author Mary Izett shows you how to make it happen. Whether you're a new or experienced brewer, you'll find time-saving techniques and recipes that save hours on brew day. You'll also find beers, ciders, and meads that pack big flavors but ferment quickly. Lesser-known fast fermentables--boozy kombucha, kefir beer, spirited sodas, and more--ensure there are plenty of exciting experiments for even the most creative brewer. Whether you decide to brew the Bia Hoi, Smoked Summer Ale, or Strawberry-Peppercorn Short Mead, weeknights will never be the same. Mary Izett is a passionate homebrewer specializing in fast and alternatively fermented beverages. She co-hosts Fuhmentaboudit!, a live weekly show on all things fermentable, on Heritage Radio Network and is a BJCP National ranked beer judge. She has been the president of both the New York City Homebrewers Guild and the Malted Barley Appreciation Society and has written for Ale Street News, All About Beer, and Zymurgy.